Las Vegas is best known for racy shows and glittery casinos, but for some visitors, the biggest gamble is riding the thrilling Las Vegas roller coaster attractions. At first, many Las Vegas visitors are stunned to learn that the city hosts high rolling thrills that have nothing to do with gaming tables and jackpot payouts. In fact, Las Vegas roller coasters have been around for more than a decade. They were first introduced in the early 1990s as part of the city's effort to become a more family-friendly destination. Roller coasters offer a fun thrill for younger guests who are more attracted to loops and curves than craps and roulette. At the same time, however, the coasters are also meant to draw more visitors to specific casinos, and their layouts are ingeniously designed to encourage guests to stop by. Most of the coasters are highly visible from the outside, but to ride them, guests must go through the casino floor, often via a winding path that offers much encouragement for indulging in a quick game or two. True roller coaster fanatics, however, will find these fun and intense rides a bigger thrill than any roll of the dice. Just as every Las Vegas casino has a distinctive theme, each of the city's roller coasters has a unique personality to thrill prospective riders. 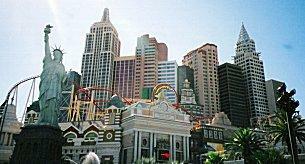 The aptly named Manhattan Express is the crowning glory of the New York New York Hotel and Casino. Built in 1997, the coaster is a stunning 203 feet high with a 144 foot drop above the streets of Manhattan - at least, above the casino's facsimile of the Manhattan skyline. Reaching nearly 70 miles per hour, the coaster features two wicked inversions that blend both Manhattan and Las Vegas thrills. Riders need to be aware, however, that the Manhattan Express can be as rough and shocking as the streets of New York City - the coaster can be a bumpy ride, and the firm harnesses can cause a headache for unsuspecting riders. Riders should remove earrings and leave loose items with a non-rider. The coaster's entrance is located on the second floor of the casino, in the back of the arcade to keep with the Coney Island theme. To find the entrance, simply follow the well-lit signs and arrows to the coaster. 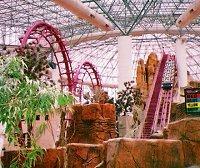 Canyon Blaster is the highlight of the Adventuredome at the Circus Circus Hotel and Casino. 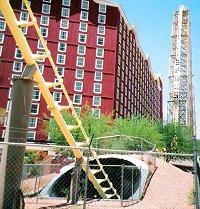 It is also the oldest Las Vegas roller coaster attraction, having first opened in 1993. While the pink track only climbs 94 feet high, because it nears the pink ceiling of the Adventuredome enclosure, the coaster feels much higher than its statistics indicate. Reaching speeds greater than 40 miles per hour, riders are blasted through four inversions, including a double vertical loop and two twisting corkscrews. The coaster's layout in the Adventuredome theme park allows interested riders an up close view of its thrills before they ride, and because it's an indoor roller coaster, it is one of the city's most comfortable rides. Furthermore, Canyon Blaster is only one focal point of the indoor theme park, and other rides and games offer a great escape for all ages. Miner Mike is the second coaster at the Adventuredome, but this one is meant for younger riders. The coaster's track is a simple oval layout with gentle curves and dips that offer a great introduction to roller coaster thrills for inexperienced riders. This makes the Adventuredome an even better attraction for families. Technically, Desperado is not in Las Vegas, though it is frequently associated with the city because it, too, it located in a Nevada casino - specifically, Buffalo Bill's Resort and Casino in Primm, Nevada, near the California border and about an hour's drive from the Las Vegas Strip. Desperado is one of the most exciting coasters in the western United States, with a 225 foot drop after only a 209 foot initial hill - yes, Desperado plummets underground through a tight tunnel at 80 miles per hour. The coaster's smooth curves and thrilling hills form an unmistakable profile in the otherwise bleak Nevada desert, summoning thrill seekers from around the world. The roller coaster is not the only attraction families will find at Buffalo Bill's, however; smaller rides and an interactive shooting gallery log flume are other fun options that make this destination a worthwhile stop during a Las Vegas vacation. There are several Las Vegas roller coaster attractions that offer fun family thrills for Sin City visitors interested in rolling along a track rather than rolling the dice. From kiddie rides to classic coasters to high tech, high-speed layouts, anyone interested in a sure thing can gamble on Las Vegas's coasters without breaking the bank.